• Sensitive and accurate. Use as little as 5 μL samples. 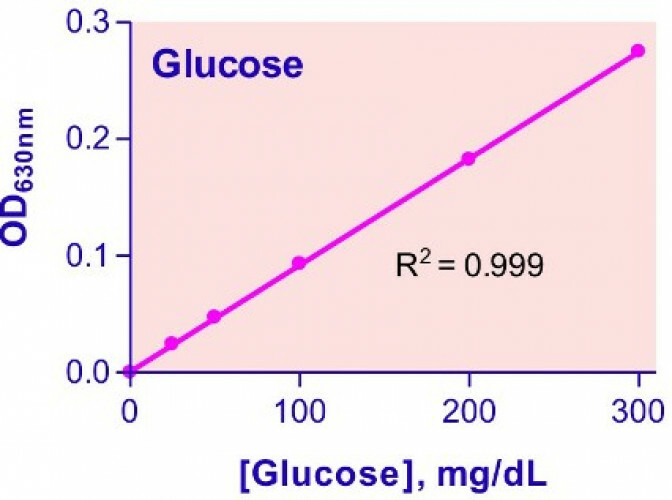 Linear detection range 0.7 mg/dL (39 μM) to 300 mg/dL (16.6 mM) glucose in 96-well plate. • Simple and convenient. The procedure involves addition of a single working reagent and incubation for 8 min in a boiling water bath. • Low interference in biological samples. No pretreatments are needed. Assays can be directly performed on serum and plasma samples. Glucose (C6H12O6) is a ubiquitous fuel molecule in biology. It is oxidized through a series of enzyme-catalyzed reactions to form carbon dioxide and water, yielding the universal energy molecule ATP. Due to its importance in metabolism, glucose level is a key diagnostic parameter for many metabolic disorders. Increased glucose levels have been associated with diabetes mellitus, hyperactivity of thyroid, pituitary and adrenal glands. Decreased levels are found in insulin secreting tumors, myxedema, hypopituitarism and hypoadrenalism. Simple, direct and automation-ready procedures for measuring glucose concentrations find wide applications in research and drug discovery. BioAssay Systems’ glucose assay kit is designed to measure glucose directly in serum or plasma without any pretreatment. The improved o-toluidine method utilizes a specific color reaction with glucose. The absorbance at 630nm is directly proportional to glucose concentration in the sample. 2. Sekowska, A et al (2009). Repulsion and metabolic switches in the collective behavior of bacterial colonies. Biophys J. 97(3):688-98. Assay: Glucose in Bacteria cell lysate (Pubmed). 3. Hedbacker, K et al (2010). Antidiabetic effects of IGFBP2, a leptin-regulated gene. Cell Metab. 11(1):11-22. Assay: Glucose in Mouse blood (Pubmed). 4. Stites, T et al (2006). Pyrroloquinoline quinone modulates mitochondrial quantity and function in mice. J Nutr. 136(2):390-6. Assay: Glucose in Mouse plasma (Pubmed). 5. Jatana, M et al (2006). Inhibition of NF-kappaB activation by 5-lipoxygenase inhibitors protects brain against injury in a rat model of focal cerebral ischemia. J Neuroinflammation 3:12. Assay: Glucose in Rat plasma (Pubmed). 6. Chiu, LL, Radisic, M (2010). Scaffolds with covalently immobilized VEGF and Angiopoietin-1 for vascularization of engineered tissues. Biomaterials 31(2):226-41. Assay: Glucose in Human endothelial cells (Pubmed). 7. Cirrik, S, Oner, G (2009). The effect of heavy muscle activity on renal cytoresistance in rats. Ren Fail. 31(8):683-9. Assay: Glucose in Rat urine (Pubmed). 8. Vaitheesvaran, B et al (2010). MKR mice have increased dynamic glucose disposal despite metabolic inflexibility, and hepatic and peripheral insulin insensitivity. Diabetologia 53(10):2224-32. Assay: Glucose in Mouse serum (Pubmed). 9. Zheng, Y et al (2007). Evaluation of different biomass materials as feedstock for fermentable sugar production. Appl Biochem Biotechnol. 137-140(1-12):423-35. Assay: Glucose in Plant diverse plant preparations (Pubmed). 10. Sullivan, JP et al (2008). Convection and hemoglobin-based oxygen carrier enhanced oxygen transport in a hepatic hollow fiber bioreactor. Artif Cells Blood Substit Immobil Biotechnol. 36(4):386-402. Assay: Glucose in NA Hepatic hollow fiber bioreactor media (Pubmed). 11. Olsen, AS et al (2010). Limb regeneration is impaired in an adult zebrafish model of diabetes mellitus. Wound Repair Regen. 18(5):532-42. Assay: Glucose in Zebrafish blood (Pubmed). 1. Li, L et al (2009). The nuclear orphan receptor COUP-TFII plays an essential role in adipogenesis, glucose homeostasis, and energy metabolism. Cell Metab. 9(1):77-87. Assay: Glucose in Mouse plasma (Pubmed).